I was hoping all you gHacks readers could help me out with some feedback on one particular topic; Music jukeboxes. I have written up my thoughts, but I would genuinely like to hear all your opinions. I’m sure we all have our favourites, so I would love to hear exactly what it is that has made you choose what you have. You may use more then one, I know I do. I also understand there is a great number of media players, so I’ve restricted this to just ‘music jukeboxes’, or music management software. I plan to work my way through all the major contenders, starting with Part 1 (WMP and iTunes) today. For these reasons some players have been excluded, such as Songbird, which is still working towards release 1.0, foobar2000 and VLC popular though they are. Apologies also for a primarily Windows focused list, I am after all a Windows user (but also dual-booting Ubuntu on occasion) so it’s what I know. The classic. Not too popular these days with music fans, although personally I don’t think it’s too bad. Much of its popularity is due to bundling with Windows, that’s granted. However it’s still one of the better music management applications. It has a attractive, easy to use interface suited for beginner users. Once you find your music collection growing the library filtering options will begin to become more limiting. I still find it a fairly attractive way for my music library to be displayed, although only if you have properly tagged music complete with album art. Tagging is decent, you can search for media if it’s inaccurate. Performance is solid, but not stellar, especially once your music collection grows beyond the 8000+ songs mark. In fact I would say once your collection grows beyond 5000 tracks it becomes just to slow to browse in more then the list view, album art drags it down. Perhaps the best all-round Media software, it includes photo, video, recorded TV and other media management. Unfortunately some of this functionality is totally superfluous, especially with Vista and Photo Gallery. Unfortunately it is also buggier then it should be, with some persistent bugs, especially when tagging, becoming a real annoyance. The biggest single problem with Windows Media Player is that it no longer seems to have a real purpose. It’s a great media manager sure, but who is it for? It’s not lightweight, those people will use VLC or something. iPod owners will use iTunes, Zune owners will use the Zune software. For organising recorded TV, Media Center does the job much better and would use it instead of Windows Live Photo Gallery for image management? I guess we’ll see what happens with WMP in Windows 7.
iTunes is very popular, largely because of the connection with the iPod and iTunes Music store, and also because it genuinely is a well-designed, intuitive and useful application. 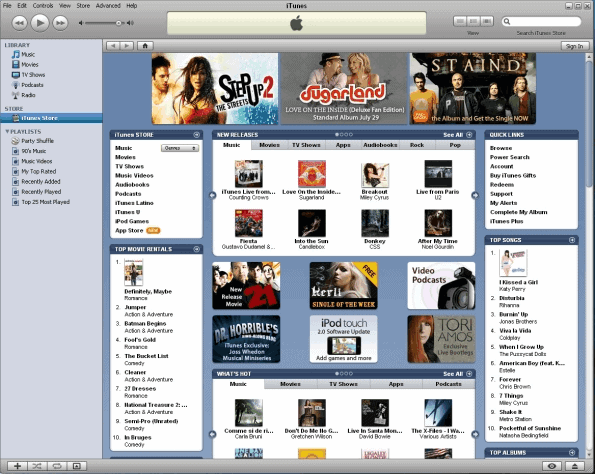 In fact it possibly is the most popular music management and media software, in so small part due to the tight integration with the iTunes online store. Significant features include the gapless playback, efficient, intuitive and minimal interface, Coverflow, automatic tagging, podcasting and auto-playlists. One of the biggest iTunes complaints has been the auto-tagging, primarily dodgy support for music not part of the iTunes online store, somewhat unreliable album art downloading and Performance and stability have also reportedly suffered with recent releases, but I can’t give an opinion on that, what have you noticed? Now I’d love to hear your opinions on both these, wether you use them or not. Tomorrow I plan to cover the major competitors to these two… MediaMonkey and WinAmp. This is the first part of Joshua's four part series about media players for Microsoft's Windows operating system. I use winamp. I’ve tried to change several times looking for something that does everything winamp does and then some. The “then some” for me would be the one thing I like about iTunes … party shuffle. I’ve given up. Winamp does everything I want it to minus the party shuffle. It’s got an attractive interface, it’s not a huge resource hog, I like how it manages my collection (20k tracks and growing), plays most any stream format I want to listen to, last.fm support and it’s easily moved from one install to another. I’m hoping they put in some kind of comparable party shuffle feature in a future release though! The one thing I’ve found that is close is Amarok. I may play with version 2 when it comes out and can be run on Windows. I used MediaMonkey for a while too but there were a few quirks with how it handled my library that I didn’t like in the end. I tried Foobar a few months ago but found it way too hard to customize. Amarok is currently my music player of choice, but I’ve tried out WMP, WinAmp, iTunes, FooBar, VLC and a few others. .out of all of them, I actually preferred WMP. It’s tight integration with Windows is what finally did it for me. Plus I found iTunes way too slow and laggy on my machine. Plus, like you said, the automatic updates were a huge hassle. An unused media player that I rarely use is MXPlay. My version is outdated and the program is still in beta, but I like the option to change the direction of sound (just for fun). It also has a load of new features that have been added since my version. What about the ability to manage and play video files? Isn’t this a main feature of a media player in times of “youtube” & co.?? This is the reason why I use Winamp. 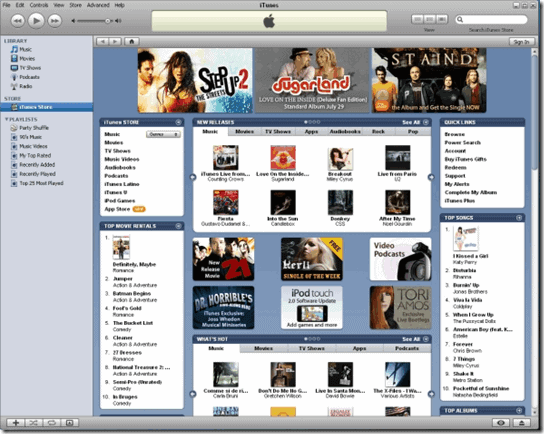 Itunes is limited in playing video file formats (i.e. flv) without converting the files and Foobar is “only” a music player and no media player (but a wonderful player). I really like Mediamonkey. Because it’s just perfectly easy to tag mp3’s with information and picture from the internet when you rip them from cd. FooBar is cool, because it uses not too much memory. I agree with Angelo, Amarok is one amazing piece of music-management software. There should be a Windows version in the next few months, from what I understand. @Dotan Yea, if all goes well, within the next few months Amarok 2.0 will be available for Windows. @Andreas That’s the only reason I ever used FooBar and VLC. For a while I was all about the minimalist applications and those were all I used, but VLC had the worst media management, and FooBar was a bit ungainly to get the hang of using. I use Media Monkey the most. Extremely useful for tagging and as well as for playing MP3’s. The second would be SM Player and then VLC. Hahah I suppose you have a point.. I also didn’t like how it was terrible for adding new music to the playlist. I like having all my music present and I can just pick and choose what album I feel like listening to at the moment. VLC took too long. Sometimes Simple is better. I have been using “Zoom Player” for 3 years as the heart of my media center. It’s simple, uses any codec configuration you want and is the only program that natively allowed me to pipe undecoded dolby to the stereo.